You probably already have access to free web space from your internet service provider, so why put up with photo sharing sites that litter your albums with advertisements of all kinds? Easy to Use - No HTML or other web skills needed; simply add photos and you instantly have a working web album (see Web View). The rest is optional - titles/descriptions, custom colors/patterns/borders, basic photo editing, etc. When done, just save and publish. Index View - The default working view displays your album as a set of thumbnail photos and lets you add and reorder photos via drag-and-drop. When you add a photo, copies are immediately made according to the size and quality settings in the Options window. Index View also allows you to optionally enter titles and descriptions (both at the album-level and the photo-level) and displays a color scheme preview panel with links for easy customization. Photo View - Displays a large view of one photo at time, with built-in support for the most common photo editing operations - rotating, cropping (with and without locked aspect ratio), adjusting brightness, and correcting tilt, all with easy one-click access. Fixing red eyes is easy too, because the functionality of the S10 RedEyes product is incorporated right into S10 WebAlbums. Support for launching external image editors is included as well. 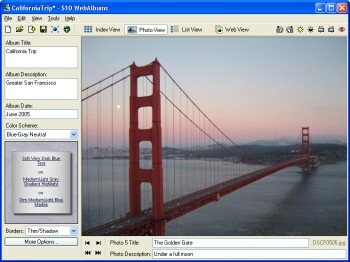 Photo View also provides the same access to titles, descriptions, and color scheme as Index View. List View - Displays a list where each row contains a thumbnail photo and corresponding title/description. Provides easy access to all photo titles and descriptions in one place. List View also provides access to album-level titles and descriptions as well as to the color scheme, the same way as in Index View and Photo View. Color Palette - You can specify color for three separate elements: Text, Text Background, and Page Background. The color palette encourages the use of professional-looking, muted shades by offering ranges of colors in five different saturation levels: Grayscale, Dim, Soft, Rich, and Bright (beware that bright primary colors tend to detract from your photos). In addition, it gives you fine-grain control over the Red, Blue, and Green components, as well as Brightness. Pattern Library - Another unique feature in S10 WebAlbums is that it lets you pick background pattern and color independently; it automatically merges them together into a custom background image which you can see in the preview pane inside the Color/Pattern selection window. This preview pane is updated in real time as you change color or pattern, making experimentation easy and fun. The 20 included patterns are of a mild, non-distracting nature (e.g., gradients, marble, water, smoke) and are designed to tile seamlessly for a smooth professional look. 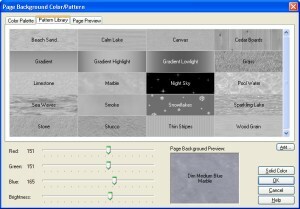 There's also support for adding your own patterns and even a built-in tool for making them tile seamlessly. Border options, preview panel - Four different border options are available: None, Thin, Thin/Shadow, and Thick/Rounded. Borders and shadows are automatically color-matched to blend in with your selected background colors. You can try the different borders via the dropdown below the color scheme preview pane in the main window. The preview pane always reflects the currently selected colors, patterns, and borders. Custom and pre-defined color schemes (themes) - The program comes with a set of pre-defined color schemes, but you can easily customize this list by creating your own or by modifying or removing existing ones. 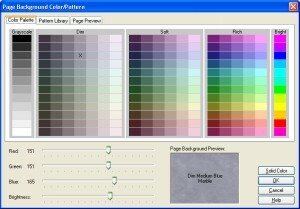 Each color scheme (theme) defines specific values for a collection of six different settings: text color, text background color and pattern, page color and pattern, and border style. 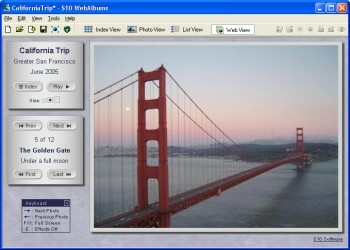 Configurable web page layout - By default the controls, titles, and descriptions will appear to the left of the photo in the web album. You can optionally change the page layout so that these items appear above the photo instead. The layout of the thumbnails on the index web page is also customizable; you can specify how many thumbnails per row you want to be displayed. Gradient shading, drop shadows, transition effects - There are many features in S10 WebAlbums that aim to produce an elegant, professional look to your web albums. 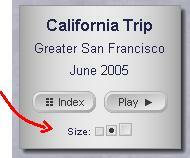 For example, gradient shading is used in various patterns, in drop shadows, as well as in the album control buttons. Another example is the availability of transition effects between photos: Fade (fades smoothly from one photo to the next), Gradient Wipe (smooth wipe from left to right when moving forward; from right to left when moving backwards), or Random (randomly selected effects with varying parameters - Fade, Gradient Wipe, Barn Door, Blinds, Checkerboard, Dissolve, Inset, Iris, Radial Wipe, Spiral, Strips, Wheel, Zigzag). Multiple photo sizes in one album - visitors can choose S/M/L - Visitors to your web album may have different screen sizes and different connection speeds, so you may want to make the photos in your web album available in multiple sizes and let the visitor choose Small, Regular, or Large. The "Options" window lets you specify the exact size in pixels to be used (width for landscape-oriented photos; height for portrait-oriented photos) for each of the three sizes as well as for the Thumbnail size (Small and Large are optional). You can also specify a photo quality setting - Medium (corresponds to a Jpeg Quality factor of 75) and High (Jpeg Quality factor 90). The High setting uses less compression and therefore provides better picture quality but larger file sizes (by approx 65%) than Medium. Auto-play slideshow feature with timer indicator - Visitors can flip through the web album at their own pace (using either the control buttons or the right/left arrow keys), or click the Play button for an automatic slideshow. The time interval between photos is configurable. Multi-language support for controls in web album - If you use a foreign language for your titles and descriptions, you probably want the control captions (Play, Stop, Next, etc.) to match. S10 WebAlbums includes support for some of the most common languages, and you can easily add support for other languages. Built-in FTP upload feature with smart update mode - Uploading a web album to your personal web space is easy with the built-in FTP (File Transfer Protocol) capability. Making a change to an already published album is just as simple (and because unmodified files are normally skipped, it is very quick). Automatic list-of-albums page generation - If you have multiple albums on your website, you can choose to have a list-of-albums page generated in the parent folder where your album folders are located. The title of the page will be the same as the parent folder name (use the underscore character to represent a space, as folder names should not contain spaces). The page will use the same color scheme and background as your current album. Full-screen web view utility for local viewing - To view a local copy of a web album, you can of course just open it with a browser or use the Web View mode described above, but S10 WebAlbums also includes a full-screen viewer that can be launched both from within the program and directly from the folder where you saved your album (double-click "viewer.hta"). Digitally signed - No embedded spyware/adware or other third-party software. Both the install package and the program executable are digitally signed by S10 Software for your security. Compact program size - Every feature in S10 WebAlbums is carefully designed to minimize the impact on the overall program size by using efficient coding techniques, leveraging .NET Framework components, and keeping image sizes small. The download is only 467KB - far below other web album programs that can sometimes approach 100MB. Disclaimers - This software is provided "as is" and without warranties of any kind. No official support is provided. In no event shall S10 Software or the author be held liable for any damages whatsoever arising from the use or inability to use the software. S10 Software is not obligated to provide maintenance releases or updates for the software. Copyright - This software is protected by copyright laws and international copyright treaties, as well as other intellectual property laws and treaties. You may not reverse engineer, de-compile or disassemble the software. S10 Software shall retain title and all ownership rights to the software. Distribution - This software may be freely distributed provided that it is free of charge, not modified, and the original archive remains intact with all accompanying files.